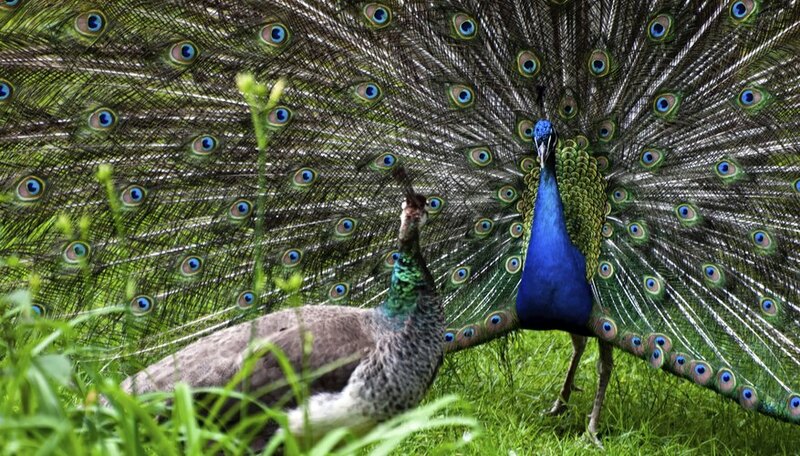 The mating rituals of peafowl -- the collective name for male peacocks and female peahens -- are marked by flashy displays of brilliant tail feathers and discerning female partners. The peacocks use their stunning blue and green tail feathers during the breeding season to advertise their sexual and physical fitness. Peahen preference for males with large, colorful tail feathers is a prime example of natural selection at work. Peafowl are typically polygynous birds, meaning that a dominant male will mate with several females in a season, although the green peafowl has been known to form monogamous pairs in captivity. Wild peahens can become aggressive with one another when competing for the chance to mate with a dominant male, sometimes repeatedly mating with the peacock to stave off mating attempts by other females. 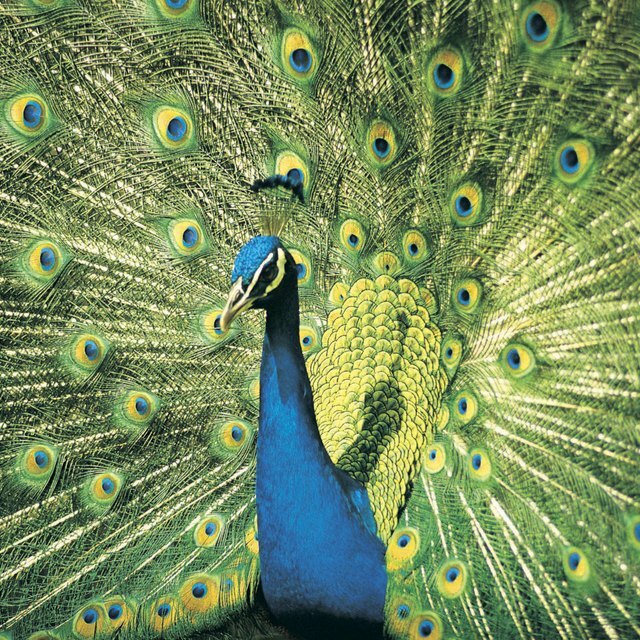 Beginning in mid to late spring, peacocks establish small territories in close proximity to one another in an arrangement known as a lek. They begin their courtship displays to attract the peahens, spreading their iridescent tail feathers in a fan shape, strutting back and forth and shaking their feathers to produce a rattling noise to get the peahens' attention. A peahen will walk through several territories of different males, examining their displays and feathers closely, before selecting a mate. Once a female selects a mate, the male perches on her back and aligns his tail over top of her own. Both peacock and peahen have the avian reproductive organ known as a cloaca, which transfers sperm in between partners. The peafowl align their cloacas and the male's sperm is transferred to the female, where it travels up the uterus to fertilize her egg through a series of muscular spasms. Peahens will lay anywhere from two to six eggs in a shallow nest at ground level, which incubate for 28 to 30 days before hatching. The peahen's preference for males with flashy feathers ensures that the peacocks with the most impressive tail fans produce the most offspring. This is the process identified by Charles Darwin as natural selection, serving to further the genes of the most physically fit peacocks over time and enhancing the signature tail over many generations. In the wild, peafowl have historically bred in areas of dense vegetation, where an exuberant display of tall tail feathers was more likely to attract a mate. Taylor Echolls is an award-winning writer whose expertise includes health, environmental and LGBT journalism. He has written for the "Valley Citizen" newspaper, where his work won first- and second-place awards in sports and outdoor features from the Idaho Press Club. Echolls holds a B.A. from Mount Holyoke College. Echolls, Taylor. "How Do Peacocks Mate?" Sciencing, https://sciencing.com/peacocks-mate-4565678.html. 13 March 2018.